Since the dawn of The Crystal Press, the two of us have celebrated Galentine’s Day. Whether we are traveling for fashion month or at home in Richmond together, we make a point to celebrate in one way or another! It is hard to believe that just 10 plus years ago this now well known celebration was coming to life through the TV show Parks and Rec and today it is a worldwide celebration between females. WE LOVE IT! While the two of us love a boozy brunch like Leslie from Parks and Rec, this year, as we sit NYFW week out for some other exciting things, we opted for a delicious Belmont Pizza and beer. Is there anything more fun that indulging yourself in a craving? Regardless of if you are meeting up with your girlfriends to celebrate, make sure you take time to let the ladies in your life know how much they mean to you. That includes yourself. Without the strong and FIERCE support of our fellow females – life would be a drag! Happy, happy Galentines day from the two of us at The Crystal Press. We love you WAY more than pizza and beer and our hearts are exploding with gratitude that you are here with us on this journey. We don’t know what the heck we would do without each and everyone of you! 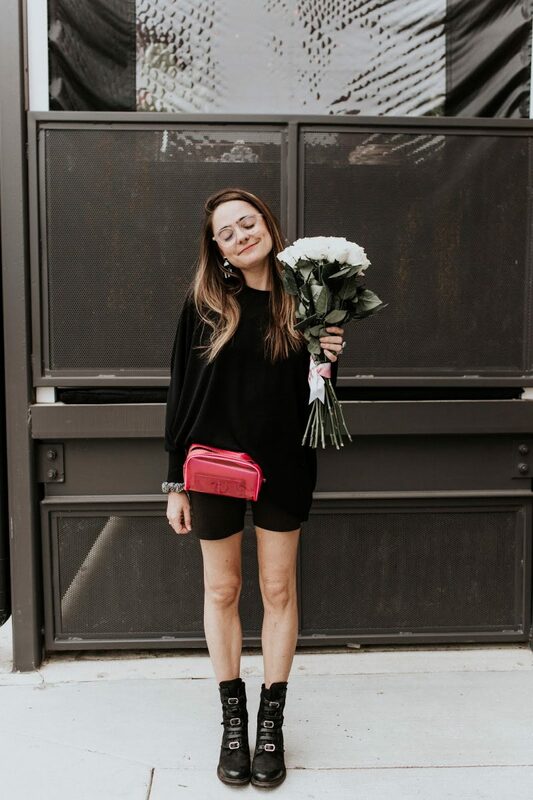 There’s definitely no rule against wearing Valentine’s Day inspired sunnies year round – so we’ve rounded up a few of our favorite pairs! Make a statement, no matter the holiday or the season with these stellar pairs! On Reb: Red Pants, ASOS. Elegance Shirt, ASOS. On Cath: Striped Culottes, Need Supply. Hat: ASOS. Button Down, Zara. (similar).